It may sound odd to be doing a recipe for BBQ pork in the middle of winter but this is Chinese style BBQ pork cooked in the oven. Way back in my mid 20s a friend and I went to Chinese cooking classes every Friday night. We learnt to cook a big selection of Chinese food and at one stage I could put together a pretty authentic Chinese style dinner with lots of dishes. I thought about it again recently when we had the crispy Peking duck so got out my recipe folder and made a few things. 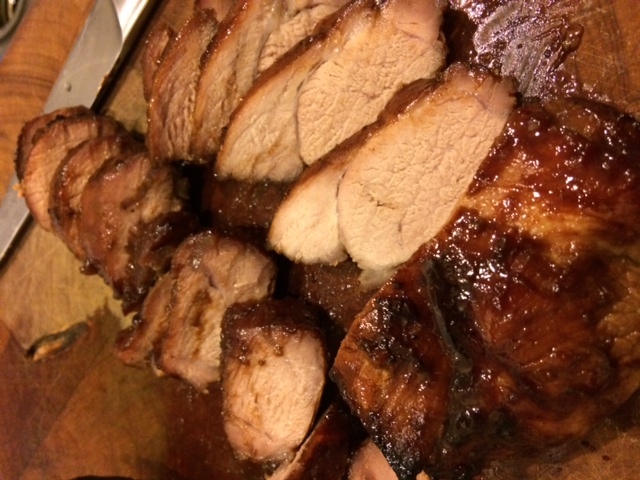 I realised that I should made this BBQ pork recipe sooner as it’s very easy and is just as nice warm or cold. Cut the pork into 3-4 equal size pieces – try and make them rectangular in shape about 3cms thick. Mix together all the rest of the ingredients (except those for basting) and rub the marinade all over the pork. Cover and leave for at least 30 minutes or up to 24 hours. Preheat the oven to 220°C. Place the pork in a baking dish and roast for 20 minutes. Baste and turn it over. Roast for another 10 minutes and baste again. It should be nicely browned all over. Remove from the oven and let it rest for a few minutes before slicing and serving.